All Good Gifts (from Godspell). Composed by Stephen Schwartz. 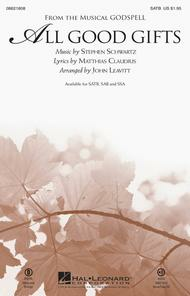 Arranged by John Leavitt. For Cello, Choral, Oboe (SATB). Broadway Choral. 16 pages. Published by Hal Leonard (HL.8621808).The beloved Godspell song becomes a sweeping anthem of gratitude in this stunning setting. With a classic hymn text and rich music by Stephen Schwartz, it is equally appropriate for concert and church use, enveloping all in a spirit of joyful celebration. Includes Oboe and Cello parts. Available separately: SATB, SAB, SSA, ShowTrax CD. Score and parts (ob, vn1-2, va, vc, db) available as a digital download. Duration: ca. 3:35. All Good Gifts by Stephen Schwartz and Godspell (Musical). For piano, voice and guitar (chords). Broadway; Musical/Show. Piano/Vocal/Guitar. 5 pages. 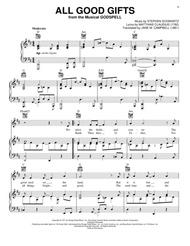 Published by Hal Leonard - Digital Sheet Music (HX.240748).About Digital Print Sheet MusicDigital Print is printable sheet music available anytime, anywhere. Just purchase, print and play! View your online sheet music at home, school, work or anywhere you have a computer connected to the Internet. Use our iPad app to view your digital sheet music on the go. With Digital Print, you can print your digital sheet music immediately after purchase, or wait until its convenient. And our software installation is easy - we'll guide you through the simple steps to make sure you have Adobe Flash Player, Adobe AIR and the Sheet Music Plus AIR application.